An powerful tool developing digital projects. Learn to design and develop web pages and more. Apply and get a 50% off for Premium v.
Learn to web develop, visually and coding. See how web pages are easily built by stacking blocks and components. 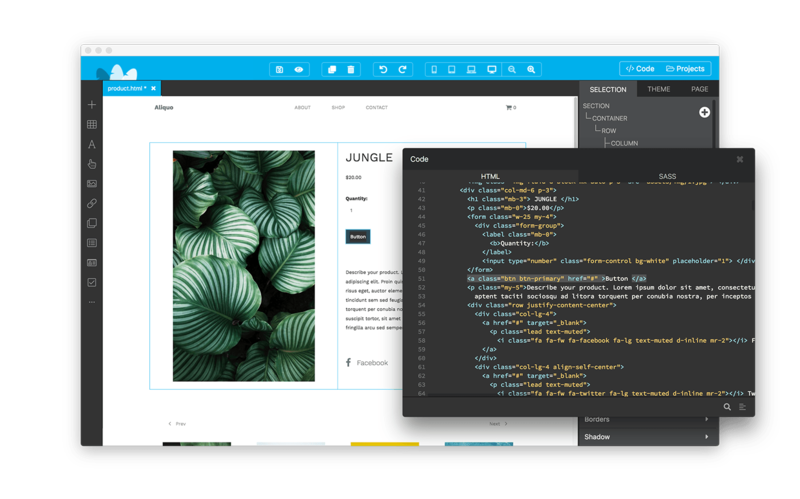 HTML / CSS code will be added in real time and is always accessible from Pingendo. Edit both visually or by the text-editor and view instantly the changes. Pingendo is loved by web development courses but they are not the only case. Communications, marketing and even high-schools workshop have been using Pingendo as a viable tool for expressing results in a intuitive way. From all over the world, Pingendo is daily used by users of all ages and nationalities, so don't be afraid of trying. Relying on Bootstrap, there is all the tutorials and docs you'll need to develop your projects. Thousands of professionals are already using it as a working tool. This license applies to students, teachers and staff of academic institutions. The discount is valid for 6 months. After expiring, you should submit again the following form.